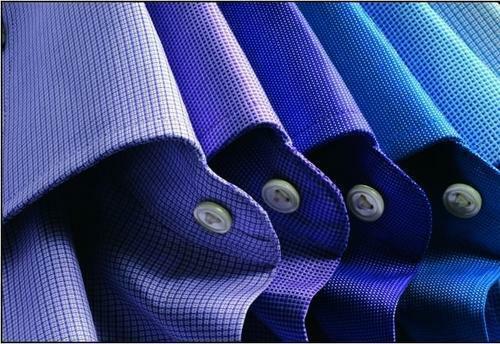 We are as the most eminent Shirting Fabric Manufacturers in India. Being manufacturers of the Polyester Cotton Shirting Fabric, we use optimum quality raw materials that make our fabrics ideal for shirting. Our shirting fabric range comprises of a wide range of designs in stripes and checks, in various kinds of weaves like Oxford, Twills, Herringbones, Fil-a-Fils and Dobbies etc. made available in a wide range of colors. Our Widths (inches): 36", 44", 58"
Packaging Details: Special packing in retail roll packs, cut-piece gift packs, lump pack. All kinds of customized packaging options available as per customer's needs and requirements. Borda Fabrics Pvt Ltd was incorporated in 2007 and is a 100% subsidiary of Borda Group which has been in manufacturing industry for over 35 years. Our vision is to be a major player in Woven Textile manufacturing. The company has its headquarters in Surat India, and has manufacturing facilities located in Sayan in the outskirts of Surat. BFL fabrics cater to both domestic and international markets covering vast area of applications for Men’s Wear, Garments, Interlinings, Home Textiles, and Technical Textiles. BFL is capable of developing fabrics specially engineered for any particular application or clients’ demand. Its dedicated team of professionals ensures delivery of the right quality product on time. BFL’s state-of-the-art infrastructure is equipped with all the necessary facilities which aid to create an elegant collection. Its skills and creative output is the consequence of their strict compliance to rigid quality standards. Due to their rich industrial background, they have the opportunity to work with some of the best technology providers as well as some of the leading experts in the field who continue to support us in our endeavor.